The IQ SensorNet wastewater treatment process monitor is a powerful, modular system designed to be flexible enough to place anywhere in your wastewater treatment system and add to it at anytime. Measure up to 20 water quality monitoring parameters. 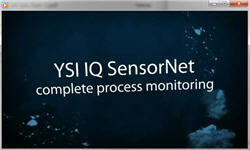 The IQ SensorNet is another wastewater treatment technology for process control.